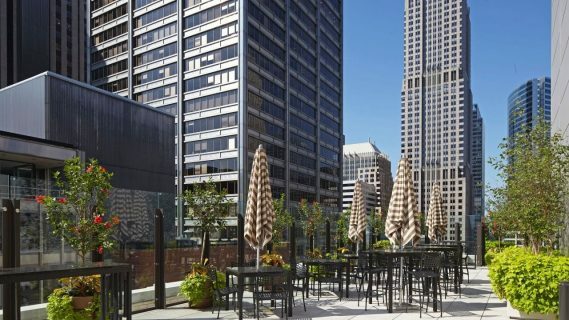 This winter has brought a whole new meaning to cold in the Windy City and the need for warmer days with a cocktail in hand on a rooftop bar is at an all-time high. From developing signature craft cocktail menus to boasting some of the best views of the city, rooftops are a hot commodity in Chicago and we have rounded up some of the best ones to visit for this upcoming season! Raised, located at 1 W. Wacker Drive, provides a stunning view of the skyline and Chicago River, with an outdoor area that features fresh flowers, fire pits, cabanas, couches and an outdoor bar with a decidedly urban feel. Under the direction of Executive Chef Russell Shearer and Restaurant Chef Tim Powles, the regular menu at Raised features American bar food with a twist, highlighting sharable plates – ideal for mixing and mingling with friends. Along with the beautiful outdoor patio, the warm and inviting interior makes Raised Bar the perfect place to enjoy stunning city views all year round. Chef Powles focuses on all things local, sourcing his menu ingredients within 200 miles of Raised. The beverage program at Raised is curated by Lauren Parton and the Raised Mixology Team and features an array of wines on tap, an extensive offering of local craft beers on draft and by the bottle, and specialty cocktails served by the glass or in a shareable decanter. The creative libations with seasonal, fresh ingredients encourage guests to sample and share. Raised was designed by The Gettys Group, fusing an industrial aesthetic with eclectic style and raw finishes. A glass wall lends to a stunning view of the skyline and Chicago River, while the outdoor area features fresh flowers, fire pits, cabanas, couches and an outdoor bar with a decidedly urban feel. AIRE, one of the Chicago’s hottest and most sensational rooftop decks, located at 100 W. Monroe on the 24th floor of Hyatt Centric The Loop Chicago, provides an unmatched urban atmosphere is at the peak of summer downtown destinations. With its central location, dramatic 360-degree view and contemporary décor, guests can escape their busy offices for an open-air hiatus or city visitors wanting to relax after a long day of exploring can unwind in luxury with friends over artisan drinks and small bites. Taking into account Chicago’s unpredictable weather, AIRE features open fireplaces for cool nights spent high above the city streets, and umbrellas for shade on sunny summer days. AIRE is also available for private events. A glamorous escape set 27 stories above the hustle and bustle of the vibrant city streets, ROOF on theWit, located at 201 N State, has proven itself as one of the hottest rooftop destinations in Chicago. With a panoramic skyline and breathtaking views, ROOF on theWit has earned international praise for its stunning design, private event spaces and entertainment programming. Rated one of the “Top 3 Rooftop Bars in the World” by Travel+Leisure, ROOF continues to excite guests with world-renowned DJs, acoustic music series and more. The 7,000-square-foot indoor/outdoor venue features a retractable ROOF and a space that is climate controlled, making the destination accessible all year-round. In addition to sweeping views of Millennium Park, the Chicago River and spectacular architectural icons, guests can enjoy a large outdoor projection screen, floor-to-ceiling windows and a high-quality telescope that can see for miles, all while sipping on handcrafted cocktails and enjoying savory small plates from ROOF’s full-service kitchen. VU, the South Loop’s first rooftop destination at 133 E Cermak, opened its doors in October 2018 and touts over 13,000 square feet of indoor and outdoor activation areas, including an exclusive karaoke room, along with a boardroom, club bar, and solarium bar. Created by the James Beard nominated Concentrics Restaurants, VU features impressive water and fire fountains on the exterior, along with the iconic skyline as the backdrop, guests are able to revel in rooftop season all year long, while also enjoying an interior that includes a sweeping 40 stool main bar, a stunning video wall and an abstract mural that makes this space truly unlike any other. Here, you can enjoy an ingredient and locally driven beverage program, top notch noshing courtesy of Chef Nolan Narut and unparalleled views of the lake and Downtown within a modern designed space. Sky Terrace, 233 E. Ontario Street, the chic, open air outdoor lounge located sixteen stories above the bustling Streeterville neighborhood, provides an inviting and tranquil retreat to take in breathtaking city views. Guests can visit the bar or grab a table to enjoy refreshing cocktails and tasty bites during the summer season.